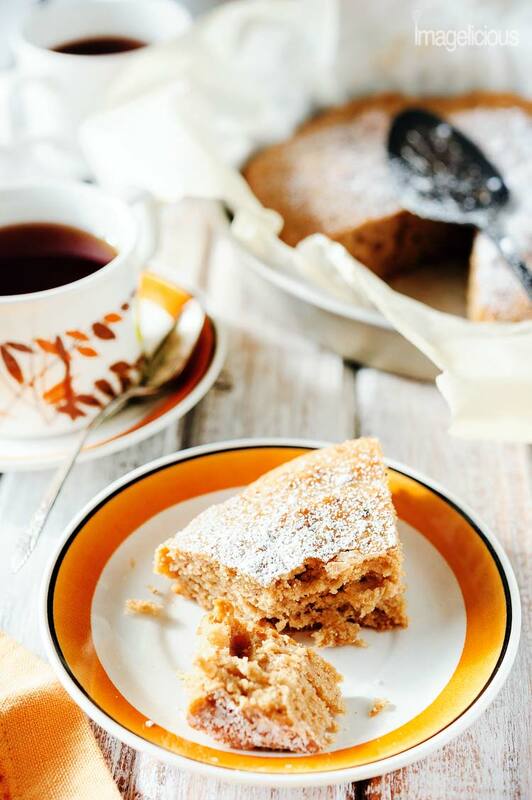 This Pumpkin Spice Vegan Cake is soft and pillowy, delicate and wonderfully spiced, no-one would ever guess that it is vegan. I received product in this post for free but all opinions are my own. I actually used and loved the product for many months before the company contacted me. I love subscription packages. There’s nothing like opening your mailbox and getting a parcel not knowing what will be inside. It reminds me of opening presents during holidays except you get to do it every month so it’s even better. Most of the subscriptions that I had were makeup or lifestyle but I had two food related packages also. First one was a breakfast box that was given to me by a friend and that sparked my subscription addiction. Second was RawSpiceBar kits. I discovered the spices almost two years ago and thought they were an absolutely perfect gift, so I gave a subscription to my brother for Christmas. Then my sister in law kept telling me about all the amazing meals he made her with the spices and I knew that I had to subscribe myself too. 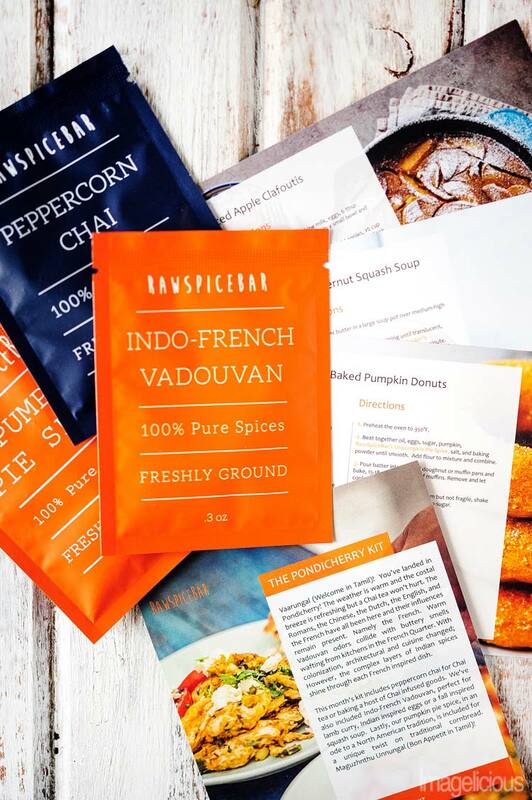 With RawSpiceBar subscription you get a small parcel every month that contains three packages of various spices from around the world. You also get recipes to make with the spices. I had this subscription for six months and didn’t resume because I was pregnant and thought that I’d never ever want to cook or eat anything again, but I made many different meals using their recipes and flavours. It was a pleasant surprise when RawSpiceBar reached out to me a few weeks ago with an offer to send me their November spices to try out their service. I jumped onto this opportunity as I already love them! Since I subscribed to them last year they changed the packaging. 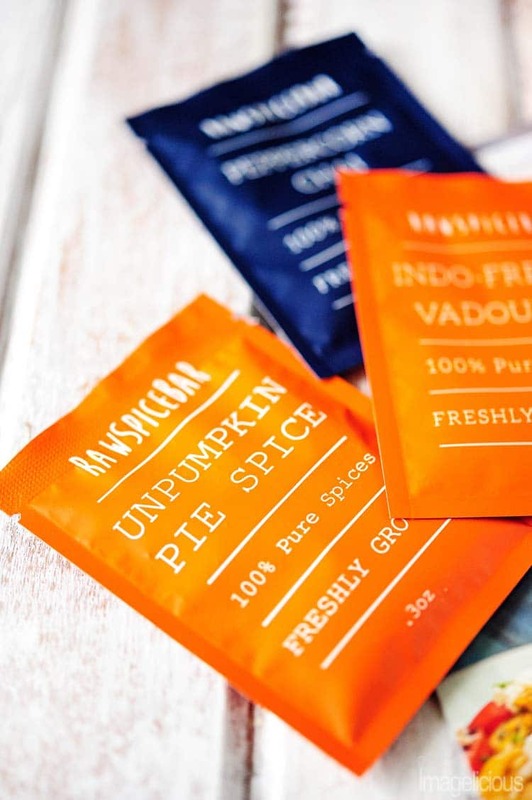 Spices used to come in brown paper bags and now they use these super cute colourful little pouches. They also now send two different recipes for each spice mix which is great as you have a choice of what to make. The actual spices are fresh, vegan, sugar-free, and gluten-free. Also, unlike most other subscriptions they cost very little, only 6-8 US$ a month with free shipping even in Canada. With holidays coming up it’s an absolutely amazing gift for a foodie in your family. I am also super excited to announce that I have a giveaway for December spices from RawSpiceBar. 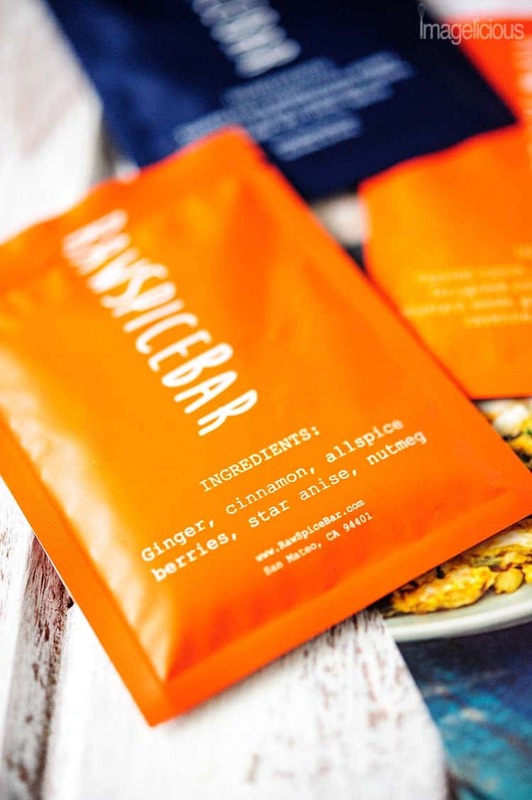 I asked the team behind RawSpiceBar and not only December spices are Holiday themed, but they also feature Icelandic flavours – I have a feeling that I’m going to subscribe for that month too! And if you don’t win, fear not! RawSpiceBar offered a 50% discount off a 1-month subscription if you use code ‘imglcious’. Scroll to the end of the post to enter the giveaway!!! Giveaway is open from November 21 to November 25 to US and Canada only. Skill testing question is required. Contest is now closed. I received a November package which included a lovely assortment of fall inspired warming spices. One of the mixes was Unpumpkin Spice, which although sounds cool and funny tasted pretty much like a really good Pumpkin Spice. Recipes provided were good, but I didn’t have the ingredients to make them, so I came up with my own recipe. Oh my! I am rarely this pleasantly surprised by my baking. 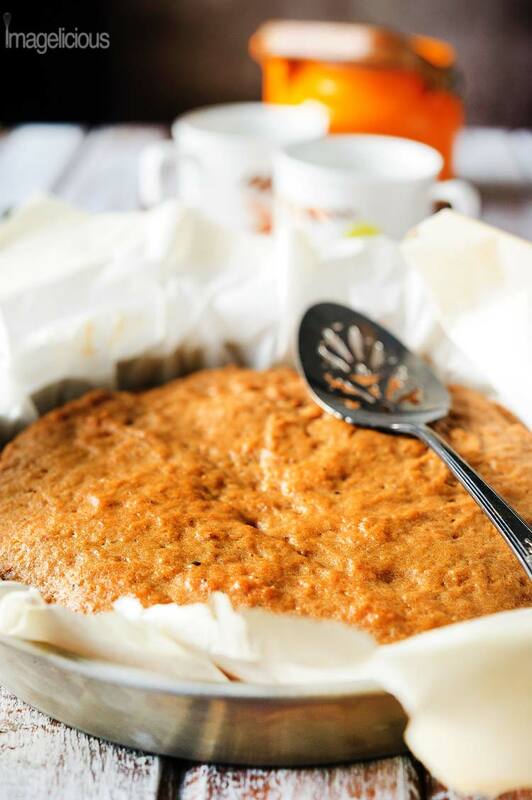 This Pumpkin Spice Vegan Cake turned out soft and pillowy, delicate and wonderfully spiced. I didn’t even notice how I ate quarter of the cake in just a few minutes. Good thing is that it’s also vegan and although it’s not totally oil-free, it only uses quarter of a cup of oil. I have a sneaking suspicion that I could reduce the oil to even 1/8 of a cup, but I haven’t tried it myself. You could also definitely reduce sugar by 1/8 of a cup in this recipe if you are ok with less sweet desserts. It’s not that sweet as it is, but it could definitely use an adjustment if you’d like to make it a little bit healthier. 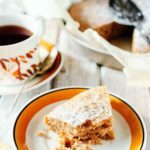 I also consider this Pumpkin Spice Vegan Cake a total Mom-recipe as it requires one bowl and one spoon to mix, no mixer or food processor or multiple bowls needed. You do need measuring cups, but there’s no going around it when baking unless you use scales to measure all the ingredients. Batter is mixed in less than 5 minutes, so if you’d like to bake the cake you actually need to turn on the oven way before you start making the cake otherwise it won’t be hot enough when you need it. My oven usually takes longer for everything, so start checking for doneness after 40 minutes or so. I always have on hand a mix of different salts! There are so many different kinds for dishes to enhance! I love to use nutmeg in both sweet and savoury and I like caraway seeds in my bread and pretzels. I love cooking and baking with cinnamon, nutmeg, and garlic the most. This cake sound amazing. It looks really good and I am sure that is as delicious as it looks. This is definitely solving the ‘what to get my father in law for Christmas’ dilemma. Thanks!! Looks and sounds delicious! I have vegan relatives, so I’m always on the lookout for a new delicious vegan recipe. I love the idea of a spice subscription! I don’t have any subscription packages.. but I feel the same way about my online shopping… except I know what is in there. I love the idea of a surprise… AND I think I might become obsessed with this cake. It looks so fluffy!! My favourite spices for baking is giner. This cake sounds so delicious. What a fun little subscription box that would be each month. I could eat this for breakfast. Parsley is a fav of mine! I love warming spices like ginger in sweet and savoury dishes, but cardamom has to be my favourite spice. I LOVE subscription services – it’s like having a gift sent to you every month! 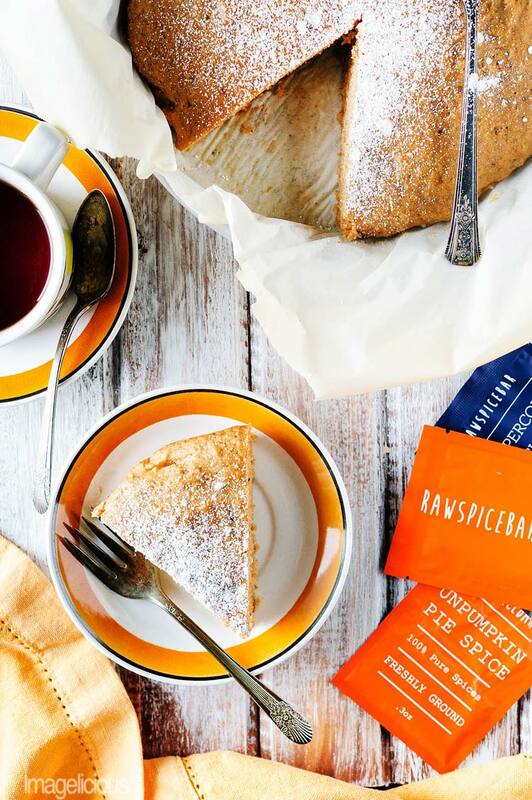 I’ll be checking out the RawSpiceBar – I love discovering new spices and it seems quite cheap too! P.S. LOVE you cake! I cannot believe you made an entire cake with spice samples! Gorgeous photos! I actually just received this spice kit in the mail. I can’t wait to try them, especially the recipe for the eggs. Your cake looks incredible. I love that it is vegan. I really like anything with pumpkin this time of year. I will have to try this. Tried Raw Spice Bar for the first time last month and loved it! Super fun with the recipe cards and everything!